Today we’re focusing on another team member from Highgate Health. 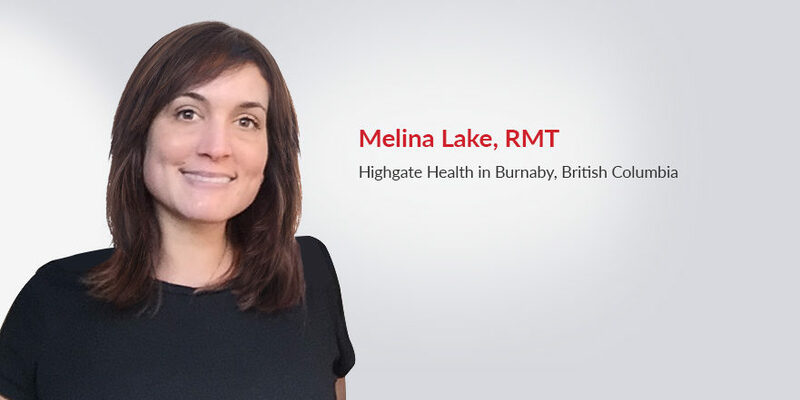 Melina Lake brings such energy and excitement to her answers that we’re sure you’ll love getting to know her and what it’s like to be a practicing registered massage therapist in beautiful Burnaby B.C. too! What drew you to pt Health? I like that the clinical setting is multidisciplinary. I instantly fit into the team and was able to take on a full schedule of patients immediately. I also have my own treatment space, so I have the flexibility and freedom to alter my schedule when I need to. I got to choose my employment type and decided to go with the split-fee Employee option. I wanted stat and vacation pay, benefits, the eligibility for EI if I take maternity leave in the future, and the education fund is a nice bonus. On average I work four eight-hour shifts a week and treat about eight patients a day. Many of the people I treat have whiplash injuries with neurological symptoms or repetitive strain injuries due to workplace duties. How long have you worked at pt Health? What is one of your favourite stories of how you helped a patient? It’s always rewarding when I try a new technique, and the patient reports less pain than before. Or after months of treating an MVA injury, the patient feels like they’re back to normal and is discharged. Are there any techniques you’re excited about? I’m learning some visceral release techniques right now. I had a patient with lumbar spine whiplash who would feel a bit better after treatments, but still had tension in her right low back and abdominal quadrant. I released her uterus and bladder, a few techniques I recently learned, and she returned a month later and reported she felt much better. I haven’t seen her much since, which is a good thing! Interested in joining the pt Health team as a registered massage therapist? See careers in your area here.